Congratulations to So Yeon Ryu who, with three tournaments to go in the 2012 LPGA season, mathematically clinched the Rookie of the Year Award. How good has her year been? Well, she has 14 Top 10 finishes in 22 LPGA starts, including a victory at the Jamie Farr Toledo Classic. That's good stuff. As I write this, she is ninth on the money list and fourth in scoring average. When Maggie Noel left college with a business degree, she headed not onto the fairways of a pro golf tour, but into the business world and behind a desk. Now, she's back in the swing and pursuing a golf career. We'll see her in the Ladies European Tour Q-School first-stage qualifier in Marrakech, Morocco, which takes place Dec. 6-9 2012. 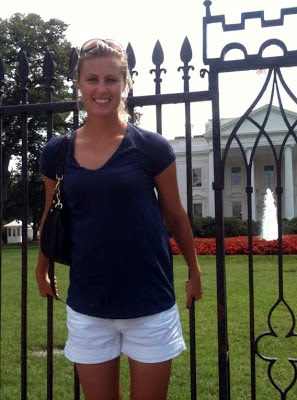 Originally from Houston, Maggie started playing golf through the First Tee program. Her junior and high school career was impressive enough to earn a college scholarship, and she played her college golf at the University of North Texas near Dallas. After graduating, she took a job in sales. But the lure of golf got her back into competition. In 2011, not long after returning to Houston and rededicating herself to competitive golf, Noel won the Women's TGA Texas State Amateur. Shortly after that success, she turned pro. 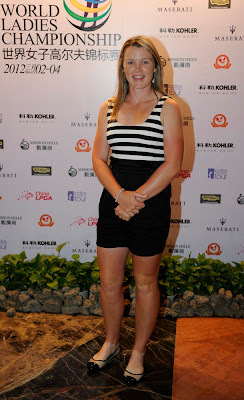 In 2012, Maggie has played some events on the Cactus Tour, with a high finish of third place so far. 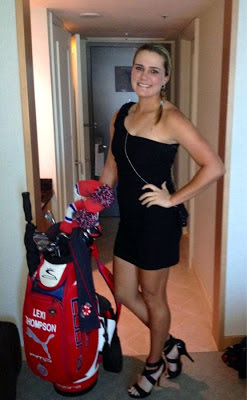 And she played in the first stage qualifier for LPGA Q-School. As you can tell from the photos, she's also done some modeling. Hopefully, she'll do more. You can follow Maggie on Twitter at @ShePlaysGolf. She also has a blog on Tumbler at sheplaysgolf.tumblr.com, and I highly recommend it. She doesn't post all that often, but when she does, her writing is more personal, in-depth and insightful than is typical from an athlete's blog. Bonus: More pics! Because it's never a bad time to post a new photo of Maiya Tanaka. This one is from her most recent photoshoot. 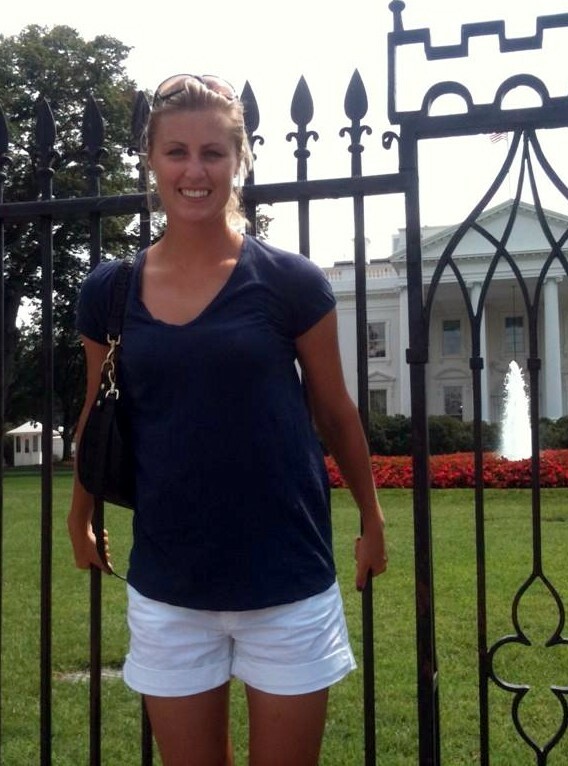 This is the first time we've featured Chelsea Bach on Golf Babes. Her story is an interesting one, because - especially in women's golf, where the paychecks are much smaller than on men's pro golf tours - sometimes a golfer's route to the tour life is a circuitous one. 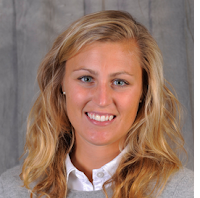 After playing many sports while growing up in a small town in Illinois, Chelsea turned her focus to golf in time to win the 2002 Illinois Girls Junior State Championship. A four-year collegiate career followed, three seasons at Illinois State and one at Eastern Illinois. But Chelsea didn't immediately pursue the life of a tour golfer. Instead, she detoured into the life of a club and teaching professional. She enrolled in the PGA Golf Management University Program and began pursuing her Class A certification to become a golf instructor. That entailed a move to Arizona. And you know what they have in Arizona? Lots of great golf courses and good weather. Pro tour events. And the Cactus Tour. She worked in the golf industry for a couple years, but her love for playing competitively kept coming back. In 2011, Bach entered LPGA Q-School and earned status on the Futures Tour, where she made her debut earlier this year. So now Chelsea is back pursuing the life of a tour professional as a career. 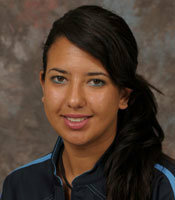 In 2012, she's played on the Women's Canadian Tour, Cactus Tour and Symetra Tour (Futures Tour). 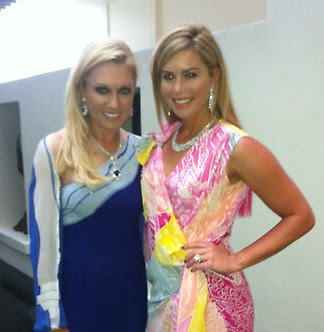 Check out her website at chelseabach.com, or follow her on Twitter at @CB_Golf. It's that time of year again: The time when Paula Creamer's calendar for the coming year is released by Golf Digest Japan. Paula shoots a calendar every year for GDJ; alas, it is only offered for sale in Japan. But if you keep an eye on eBay and other online auction/reseller sites, you might be able to pick one up. Or, if you can read Japanese, check out this page. 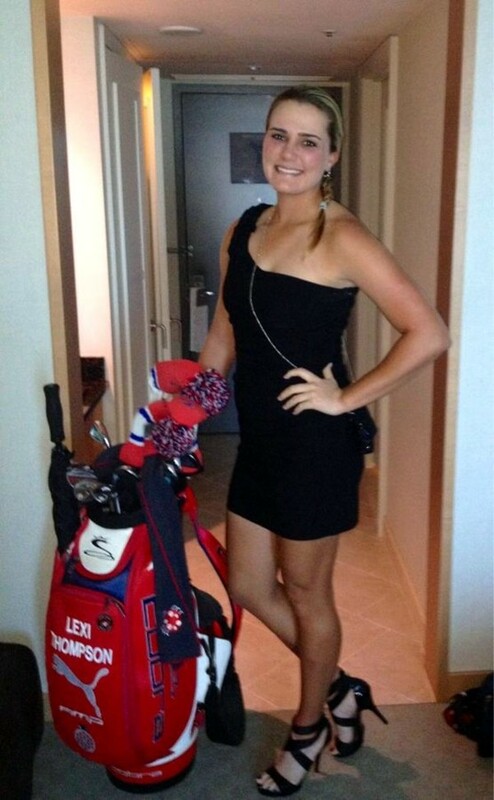 Lexi Thompson is all dressed up to attend the Hana Bank Championship gala dinner. She seems a little overdressed for that staff bag ... but her spikes are nice. 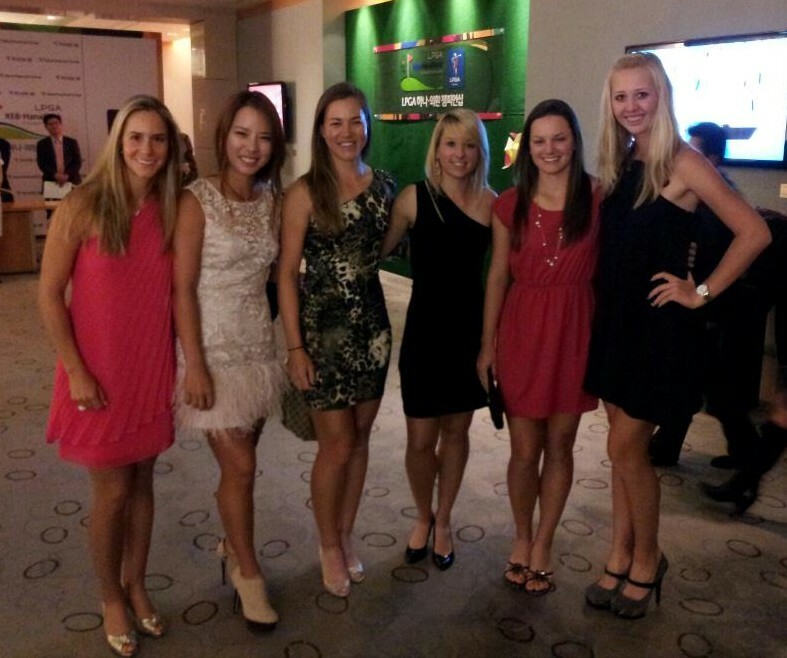 From left, that's Azahara Munoz, Park, Vicky Hurst, Jodi Ewart, Cindy Lacrosse and Jessica Korda. 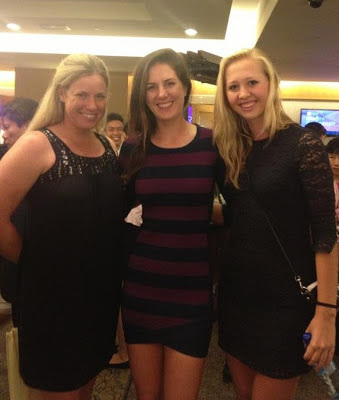 From left, that's Wie, Na Yeon Choi, Sandra Gal and Hee Young Park. 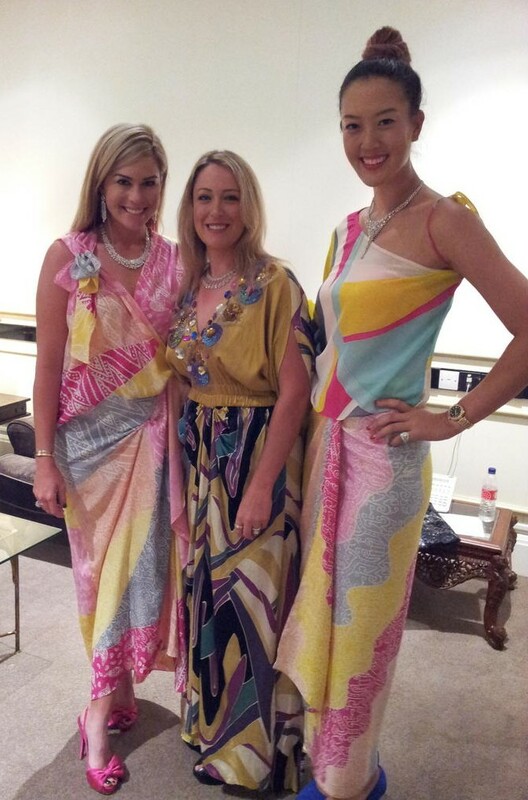 The dresses worn by Natalie, Paula and Michelle were handmade from Malaysian materials in the traditional way. We also see above Lexi Thompson, plus Brittany Lincicome, Sandra Gal and Jessica Korda. Two in a row for Stacey Keating. The 26-year-old Australian won her second consecutive tournament on the Ladies European Tour, earning the win at the 2012 Lacoste Ladies Open de France. That follows on the heels of Keating's win two weeks at the Ladies Spanish Open. "After the disappointment of the British I was really low in confidence, but obviously not now, so I'm very happy. I've been playing well leading up to the British as well so it was just how I was going to handle it mentally as well I guess. "I had no expectations because I was so disappointed and that hurt me a lot. Nothing on the golf course can hurt me like that now." Stacey received the trophy from the president of Lacoste, with European Ryder Cup captain Jose Maria Olazabal on hand to lend a hand. And one of Keating's heroes, Lorena Ochoa, was also there to help congratulate her. 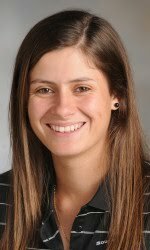 Ochoa made one of her now-rare playing appearances in the tournament, finishing tied for 22nd. Win McMurry is best-known for her role on the Golf Channel. But she's also a "golf industry ambassador" for the women's apparel company Birdy & Grace. "Golf clothes for her should be an effortless balance between practicality and femininity while keeping the spirit of timeless style alive…clean lines, powerful use of color, pattern and texture, super fit and tasteful detailing." 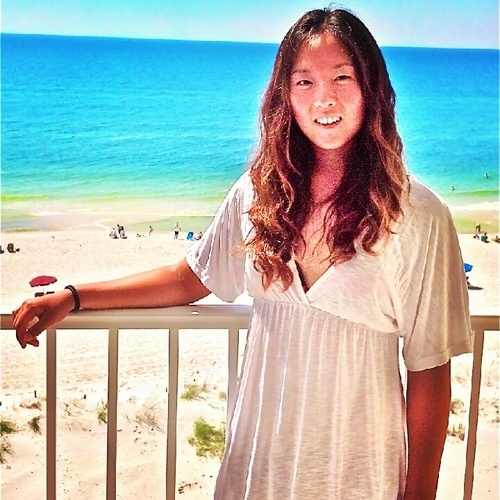 And Win adds, "I love the femininity that Birdy & Grace brings to the game of golf. When you put on one of their ultra-soft, figure-flattering polos you instantly feel beautiful. As the saying goes - when you look pretty, you feel pretty, you play pretty." I'm not sure if that really is a saying, but coming from Win, we'll go along with it. The photo below shows McMurry modeling a top from the Birdy & Grace Spring 2013 collection, the Jamie Camp Polo in gloss. You can find more info about the collection (and photos of Win modeling it) at the Birdy & Grace website.